How to use viedo call? so very bad. I have a love / hate relationship with this phone. Generally it works pretty well however every month or so I need to do a total reset on it so that it can re-connect with wifi. The reset involves backing everything up and then resetting the OS to the factory state. It does not seem to have enough ram to run the current google maps app reliably. It seems unlikely that sony will update the OS past 4.0.3.
ashish, 28 Mar 2013I am little confused between Xperia U and Xperia Neo L.Which would be better in every specs ? ... moreis it best phn? pranav, 31 Mar 2014Sony did a big mistake by closing the manufacturing of xperia uu they should update it by prov... moreXperia M is probably the most logical successor, and has microSD expansion and 1GB RAM. Slightly bigger screen but same resolution and still a budget-to-midrange model. Some aspects are a sidegrade or even downgrade though - e.g. colour rendition, and internal storage available given that apps are not able to be stored on microSD. Update to 4.3 currently being rolled out. Norbert, 28 Mar 2014http://cdn.gsmarena.com/vv/reviewsimg/sony-xperia-u/phone/thumb/gsmarena_022.jpg In the Abo... moreBottom cap hides microphone and lanyard loop point, from memory. There's nothing too interesting there otherwise. 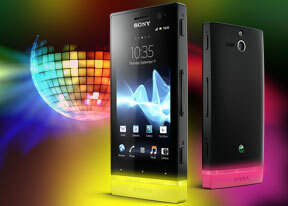 In the Above link it has a Back side image of Sony Xperia U. On the bottom of a Phone there is a port which is covered by cap. Anyone please tell me for what that port is used. DAS, 08 Oct 2013How can I make a video call?3G video calling is a network specific function, and not supported on the Xperia U. However Skype and other preinstalled and downloadable applications allow video calling via the secondary front-facing camera to others with compatible software installed on their phone, laptop or desktop. The Xperia U has 8GB of built-in flash memory, and is not internally expandable. Of that, 4GB is available via USB (MTP protocol) for music, video, images etc. 2GB is reserved for phone storage, such as text messages and some applications - many applications are able also to use the main 4GB area. The remaining 2GB is hidden and used exclusively by the Android operating system. So the total memory available to users is 6GB, though only 4GB of that is directly accessible. Mentions of 56GB refer to the availability of an additional 50GB free on-line "cloud" storage. How can I make a video call? Absolutely working good . No waste of money n it's gives good experience n Sony product are excellent . How to make video call or 3G???? how to use the video call in xperia st25 u?